A letter by the queen in the wake of Diana's death has come to light. camera (Anwar Hussein/Getty Images) Prince William arrives with Diana, Princess of Wales and Prince Harry for his first day at Eton College on September 16, 1995 in Windsor, England. A letter by Queen Elizabeth six days after Princess Diana's death has come to light. The letter from Queen Elizabeth to one of her closest aides, Lady Henriette Abel Smith, a lady in waiting, gives a rare glimpse into the depth of emotion that enveloped the royal family in the wake of Princess Diana's death. "It was indeed dreadfully sad, and she is a huge loss to the country. But the public reaction to her death, and the service in the Abbey, seem to have united people round the world in a rather inspiring way. William and Harry have been so brave and I am very proud of them," Queen Elizabeth wrote in the letter. "I think your letter was one of the first I opened — emotions are still so mixed up but we have all been through a very bad experience!" the queen wrote in her handwritten postscript. Prince William and Prince Harry were with Queen Elizabeth, Prince Philip and Prince Charles at Balmoral as cards, notes and floral tributes flooded in after Princess Diana's death. When the royal family returned to London, William, then 15, and Harry, then 12, were seen with their father looking closely at the sea of floral tributes that stretched from the Kensington Palace gates hundreds of feet through Kensington Palace Gardens to the street. With the British nation mourning Princess Diana, Queen Elizabeth made a rare address to the country the night before Diana's funeral, speaking she said "as a monarch and a grandmother." The broadcast from Buckingham Palace, which has become a defining moment of her monarchy, was clearly spoken from the heart by the Queen, who was dressed in black. Harry recently opened up publicly for the first time about what it was like to walk behind his mother's coffin. "My mother had just died and I had to walk a long way behind her coffin surrounded by thousands of people watching me while millions more did on television," Harry told Newsweek magazine in an interview published last month. "I don't think any child should be asked to do that under any circumstances. I don't think it would happen today." Harry admitted earlier this year the "total chaos" and near breakdown he had after Diana's death. He credited William with encouraging him to get counseling to deal with his grief. Princess Diana's brother, Charles Spencer, told the BBC last month that it was a "bizarre and cruel thing" for Diana's sons to be forced to walk behind the funeral cortège and that he had been "lied to and told they wanted to do it, which of course they didn't "
The newly-found letter sheds light on the swirling emotions that Queen Elizabeth and the royal family were dealing with in the days following Diana's death. The queen’s poignant broadcast praising Diana will be forever etched in the public's memory. “I admired and respected her — for her energy and commitment to others, and especially for her devotion to her two boys. This week at Balmoral, we have all been trying to help William and Harry come to terms with the devastating loss that they and the rest of us have suffered,” she said. 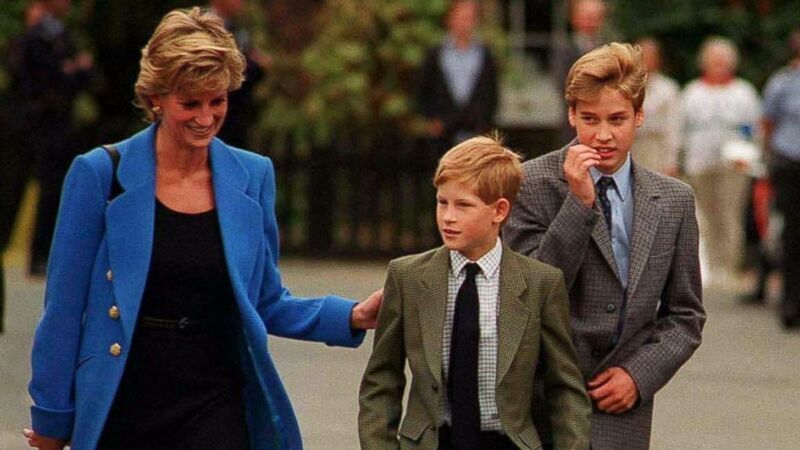 Kensington Palace recently announced a number of events to mark the 20th anniversary of Diana's death. William and Harry participated in an intimate documentary about their mother, who was just 36 when she died. "All I can hear is her laugh in my head and that sort of crazy laugh of where there was just pure happiness shown on her face," Harry said in the documentary, "Diana, Our Mother: Life and Legacy." "One of her mottos to me was, you know, 'You can be as naughty as you want, just don't get caught.'"